The history of Microsoft Outlook software stretches back to 1992, and the release of Outlook for MS-DOS. This original release was a far cry from the multi-functional communications and time-management tool that is now a fixture in offices around the world, which really goes to show just how far this application has developed. About to enter its ninth full release on the Windows platform as part of Microsoft Office 2010, Outlook is available as a standalone application and as part of various office suites over the years. This is in contrast to its initial release, where it was available only as a bundled component of Microsoft Exchange Server 5.5. Since then, of course, the world has changed considerably. Whereas only certain businesses had email access 20 years ago, electronic mail is now on mobile phones, TV set-top boxes and even hi-tech kitchen utilities. Just as consumer and business electronics have evolved and changed over the years, so has Microsoft Outlook (also for a time known as Microsoft Office Outlook). Following release of Outlook for Windows 3.1 in 1992 (also bundled with Exchange Server 5.5), the application was moved into the office suite as the potential and popularity of email became apparent. By the release of Microsoft Office 97, Outlook had developed into a more powerful application, although it remained bundled with later versions of Exchange Server 5.5. It was in 1998 that the world really began to sit up and take notice of email and the internet. Thanks to companies like Dell and Compaq reducing the prices of consumer PCs, households across Europe and America suddenly found that PCs no longer cost thousands of dollars, and with a great advertising campaign for Intel-based machines, “getting online" became a popular consumer choice. 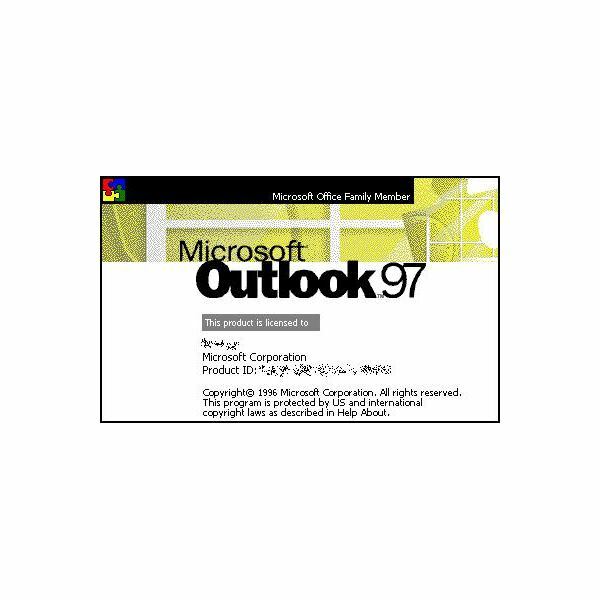 As a result, and as an attempt to popularise the latest internet standard HTML mail, Microsoft released Outlook 98, a free version of the application that could be used simply by buying a copy of various popular PC magazines. With the turn of the century, however, Outlook would reclaim its place as a premium email and time management tool, shipping as part of Exchange 2000 Server, Microsoft Office 2000 and as a standalone application. Several releases of Outlook have been made since 1999 – Office XP (known internally at Microsoft as version 10) was released in 2001, and featured Outlook 2002, the only application within the suite to have the “2002" title (with the others labelled “XP"). A couple of years later, Outlook 2003 was released standalone, with Office 2003 and with Exchange Server 2003, and this was the first time that Outlook was included in lower-price, targeted releases of Office, in this case the Standard Edition for Students and Teachers. By the time of Microsoft Office 2007, newsgroup support had been dropped from the application – however along with close integration with other aspects of the Office suite, Outlook adopted support for the now ubiquitous RSS format of syndicated news feeds. Microsoft Office 2010 meanwhile sees the application equipped with the Microsoft “ribbon" menu format, and a tidied up user interface. The history of Microsoft Outlook software and success of the application over the years has relied on releases with tighter security, relevant new features and full integration with Microsoft Office – and this looks set to continue.